From the first pages of the original book to the opening levels of the first Metro 2033 game, author Dmitry Glukhovsky and developer 4A have crafted a bleak world of survival and choices. The world of Metro Exodus continues that harsh fight to survive: a post apocalyptic wasteland destroyed by a global nuclear war. It’s a landscape filed with desperate survivors and mutated creatures, full of threats and hard choices. The survivors that remain have been forced to live underground, in the tunnels and stations of the Metro system, living on mushrooms and hope - scratching out an extension more than a life. Living in these dark corridors is a grim and grinding ongoing fight to scrape and scavenge for every scrap of food, where radiation and pollution means even the air you breath can be a luxury. 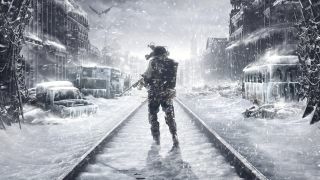 It’s created a series known for its stealth and survival gameplay and it’s something Metro Exodus continues. With so little to go around you’re forced to find and craft what you need, to avoid conflict rather than waste resources, and to be really be sure about what you’re about to do because there’s no room for error when you’re down to your last few bullets and something horrible is heading your way in the dark. There are no easy answers here, simply the choices you think are best. Whether you clean your gun to stop it jamming or use the chemicals to craft a medical kit instead? Maybe you want to ditch the stealthy silencers for something noisier but more damaging? It all affects how you play and what happens to you in Metro Exodus. It’s a game where deciding when and how to fight is almost a more important skill than your actual combat ability. Sure, you could charge in guns blazing, but what about creeping around and turning of the lights to create safe shadows you can use to avoid enemies, or take them out without anyone seeing. But while the fight to survive hasn’t changed in Metro Exodus, the reason why has, as as returning hero Atyom discovers a life outside of the tunnels where civilisation of a sort has survived on the surfaces, away from the bomb craters of Moscow. Armed with this new knowledge he sets out on a train ride across the radiation scarred surface to find a new world above ground. As you explore you’ll have to use everything you’ve learned underground as you craft your own weapons and upgrade your gear to deal with the threats you encounter. This isn’t a world that’s been left standing while you’ve been gone. Societies, factions and entire new religions have risen while you’ve been away and, while there are threats, there are also friends to be made. You’ll can decide when to take a life as well as when to spare one, and these choices, along with who to trust will shape an uncertain future from your actions. The choices you make impact the world around you, forming new relationships and opportunities, or creating entirely new dangers. But, the biggest choice you’ll have to face is just how far you’ll go and what you’ll do to protect your life, and those that rely on you. Will you sacrifice everything when there’s nothing left to lose?